After doing some research, I came across a great e-book on the ins and outs of inbound and outbound marketing. As a marketing student, years ago, we’d been taught that any internal communications meant creating newsletters and memos within the company and external was any type of communication/marketing that we would send out via direct mail, email, magazine ads, radio ads, etc. to the consumer. 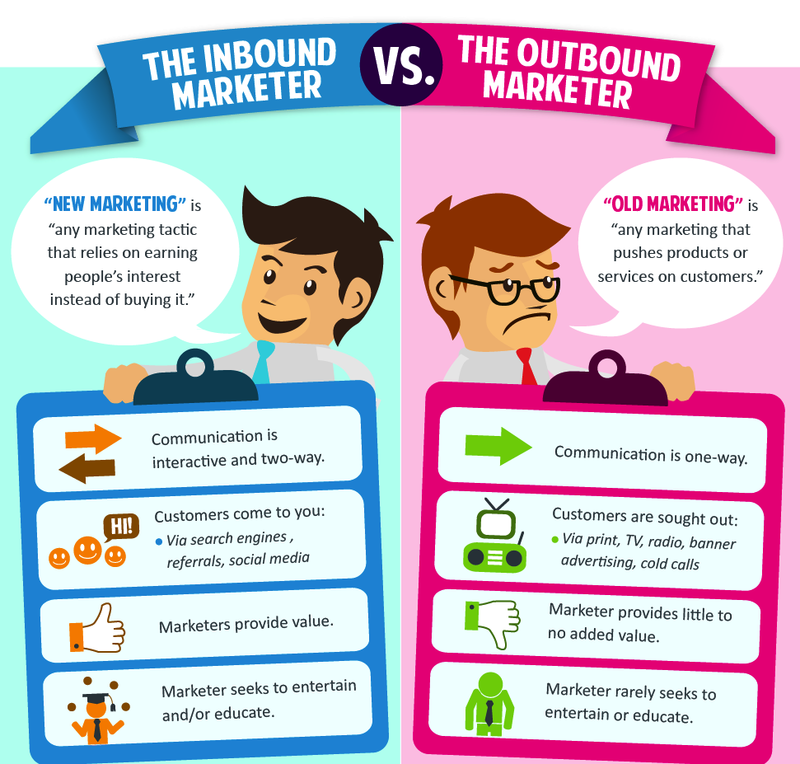 So what fits into the definition of inbound marketing? Content is the crucial key inside inbound marketing. Utilizing everything from blog posts and videos to white papers, case studies and free trials, you can create content that educates, inspires and compels your audience to share it with their networks. This content can take the form of articles, webinars, white papers, eBooks, slide presentations, videos and more, and can be shared via blogs, third-party sites, and social media where your prospects “find” you. By placing SEO-optimized keywords in your content as well as using social media such as Facebook, Twitter & Google+, blog syndication sites like Business 2 Community and even social media clout sites such as Empire Avenue to promote your content; prospects will be able to find you online. Doing this can help you maximize your reach and increase traffic to your blog. But, mistakes in inbound marketing can happen. Your aim is too wide: You spend too much time running “carpet-bombing” style campaigns, under the belief that they will reach the most people and then wonder why you don’t produce better results. To connect with prospective buyers –you need to switch to delivering high-quality content to the right people in an engaging way – and doing so across multiple channels. Some prospects find you, others don’t know you exist: There are two things happening here. First, some people don’t realize they should or could seek you out. Think about it: If you don’t know about something, you can’t search for it. You may not be sharing the right type of content or sharing it in the right place for your prospect to find it. For example, you might create white papers about your product, but if prospects are searching on terms related to their problems and you only talk about your solution, potential buyers probably won’t find your content. You aren’t reaching the decision makers: Why? It’s unlikely that CXOs are going to spend time trolling the web for blogs or other content. It’s far more likely that they assign this exercise to someone working for them. Sometimes you can’t break through the noise: Many times companies pour lots of effort into their inbound marketing around big events such as trade shows. Unfortunately, that is the hardest time to get noticed. In a future blog post, I’ll be focusing more on how to balance out some of these mistakes in inbound marketing with a hybrid strategy that includes outbound marketing. For more content strategies & tips, check out my post on 22 Ideas to Beat Writers’ Block. Recently, I started looking into learning more about Google+. With new business opportunities and more chances to place content on different platforms, I decided to also expand the social media platforms that I was syndicating content on. After using the platform for a period of time, I wanted more info on what I could be doing better, so I did some research. I’ve put together this post for anyone who has ever thought about using Google+ but doesn’t know where to start. 1) Complete the About Page: The about page is a fantastic opportunity to give a quick overview of what your business is all about. You can also link back to specific pages and services from this page directing potential customers to the most important pages on your website. Take advantage of the fact that Google+ allows you to use bullets in your description which makes it simple to create an easy to read list of your products and services. You can also include links to specific pages and a contact form. 2) Google Events: The Events feature which allows G+ users to send out customized invitations to anyone regardless of whether or not they are G+ users. It syncs beautifully with Google Calendar and shows up automatically when a user confirms for an event. In addition to sending out invites to webinars, work functions, parties, etc., Google Events can also send out invites for Google Hangouts. The “Party mode” feature of Events allows everyone in attendance to instantly upload pictures to the same album using the Google+ mobile app, creating a living, real-time photo journal of a specific time and place. 3) Post Often and Optimize: It’s important to include keywords within your posts so that they will show up in your followers’ search results. Google’s search algorithm includes personalized search results specifically pulled from Google+ activity. The more relevant and content-based your Google+ posts are, the more search results you are likely to show up in. 4) Claim your ownership of content. Google Authorship is how Google authenticates and will increasingly begin to “trust” you as a quality source of content. You set up Google Authorship identifying yourself to Google through your Google+ profile and then link back to it from your content and vice versa. Google authorship is the easiest way to take advantage of the SEO benefits of Google+. Doing so will allow the author’s picture to show up next to his blog posts in Google search results, causing higher rankings and click through rates. Step 2: Link from your Google Plus profile back to your blog. After you add a link to your Google Plus profile on each one of your blog posts, the last step is to link from the opposite direction, from your Google Plus profile to your blog. You do this by adding a link to your blog in the “Contributor to” section of your Google plus profile. I hope this helps those of you struggling on how to use Google+. I know it opened my eyes on how to effectively incorporate another social media platform to my strategy for my business. PS. Stay tuned on here for more marketing tools & tips, social media advice & how-tos as well as fun posts on unique interior design & architecture and commentary on Victoria’s food scene.